Gus had a hunger in his heart that he could not satisfy. He was not hungering after something to eat, but for something else. He did not know what to do about it or how to handle it, and that made him sad. Every day he went to school with a lunchbox filled with the most delicious sandwiches, a juicy fruit or two and a special treat for the day. But all of that could not satisfy his hungry heart. In class, Gus sat next to Frank, but Frank had another kind of hunger he could not satisfy. His father had lost his job and there was barely enough food in the house for everybody. They were only just getting by. As the days went by, the hunger in Gus' heart got worse and he hardly smiled anymore. So did Frank's appearance as his shoes looked more worn, the colors of his old clothes began to fade, and he no longer brought a lunchbox to school. One day in math class, Frank's stomach began to rumble from hunger. He quickly folded his arms across his stomach, blushing a little. Mister Baker, the math teacher, didn't even hear a thing, but Gus did. He remembered his mom packing his lunchbox to the brim and he decided to do something about Frank's tummy. So during lunch break, with his lunchbox in his hand, Gus went over to Frank, sitting alone on under a small tree on the playgrounds, fidgeting with his shoelaces. "Hi, Frank. Would you mind if I join you?" Gus asked with a friendly smile. Frank looked up with a shy smile and said, "Sure, Gus." Gus noticed that Frank couldn't keep his hungry eyes off his lunchbox and, as he sat down, he said, "Would you mind if I shared some of my food with you? My mother stacked my lunchbox with enough for two and I really wouldn't like to disappoint her by taking it back home with leftovers." Gratefully, Frank accepted Gus' offer and they put away the mouthwatering treats. The next day, Gus did the same and while they were munching on some meatballs, he decided to spill his guts. "Frank, I have a hunger I don't know how to satisfy. It's not for food, but for something else deep in my heart. Since yesterday, when I began sharing my lunch with you, I am feeling a bit better, but something is still missing." Frank smiled and said, "Maybe I can help you with that." He paused and then said quite unexpectedly, "You must eat God." Shocked, Gus replied, "WHAT IS IT? What in the world are you saying?" "You must eat Jesus!" Frank continued. "Jesus said so Himself when He was walking on this earth." Gus, wondering if Frank wasn't a bit crazy upstairs, said, "How can I eat Someone Who has died and gone to heaven?" "No, silly!" Frank smiled. "To 'eat Jesus' means to believe in Him. The more you get to know Him, the more He will satisfy the longing in your heart and the stronger your faith will grow. Won't you come with me to our church's youth group tonight? Then you can learn all about Jesus satisfying your hungry heart." Have you ever been away from home for a long time? Well, a month and a half after leaving Egypt and miraculously being delivered by walking through the Red Sea on dry land, Moses led the Israelites through the wilderness of Sin. There were sand and stone everywhere. They were running out of supplies. Seeing only their problems caused the Israelites to be very unhappy, because they didn't trust the Lord fully. The people were so dissatisfied that they forgot all about how hard it had been, being slaves in Egypt. They even forgot about the awesome miracles God had performed to deliver them from Egypt. On top of that, they even doubted that it was really the Lord Who led them out of Egypt, so they began to murmur among themselves. They complained, "Moses, this is all YOUR fault, not ours! Back in Egypt we had meat and bread, lush green crops and fruit trees. Now, here in this desolate place, there's nothing but inedible sand and stone. Why didn't the Lord kill us in Egypt with the plagues? It would have been better than dying a terrible death of starvation here in this barren desert." 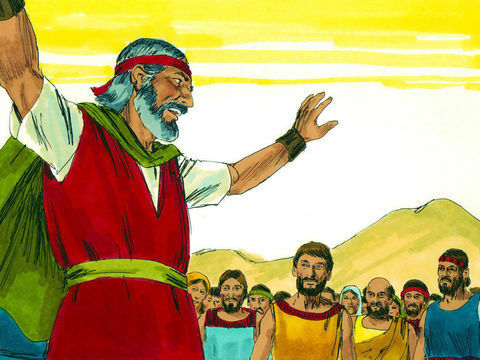 Moses, their loving leader, humbly went to pray and the Lord replied, "I am going to give the people meat tonight and bread raining down from heaven in the morning. Everybody will be able to gather as much as they need. I will test them, too, to see if they will obey a simple command: They will be able to gather this food for 6 days. On the 6th day, they must gather twice as much, because on the 7th day, there will be nothing. Then they must rest from gathering food." Then Moses and Aaron gathered all the people and said, "The Lord has heard your murmuring and He said, you are not really complaining against us, but against Him. But the Lord loves you and wants you to see his glory. That is why He will send you meat to eat this evening, and early tomorrow morning, He will send you an abundant supply of bread. He wants you to come close to Him and see his glory so that you can know that He cares about you and will provide for you." As the people were listening to Moses and Aaron, suddenly, the radiant glory of the Lord appeared in the clouds. The Israelites were in awe and Moses hoped that seeing the glory of the Lord would encourage them to believe with all their hearts that the Lord loved them and would care for them wherever they would go. He knew that if they did not learn to trust the Lord, they would remain disgruntled slaves in their hearts. That evening, the Israelites heard a rushing sound in the distance. It couldn't be the Egyptians coming, because their army was destroyed in the Red Sea. The Israelites wondered what it could be and, as it came closer, they could hear the flapping sound of thousands upon thousands of wings. Yes, the Lord was true to his Word and, just as He promised, swarms of quail came flying into the camp, landing on their tents, on their possessions and on the ground. They saw with their own eyes that the Lord cared for them and, that evening, they all stuffed their rumbling tummies with delicious, roasted quails. The next morning, dew covered the desert around the camp and when it disappeared, flakey white stuff was left behind. It looked like frost but didn't feel cold and didn't melt when they touched it. It was the first time in all of their lives the Israelites saw something like that. The inquisitive children said, "Mom! Dad! WHAT IS IT?" Moms and dads frowned, looking puzzled at each other, and asked, "WHAT IS IT? We don't know. Let's go, ask Moses." Moses explained to them, "It's the bread that the Lord promised to give you. You will eat this bread for as long as you travel through the desert, until you enter the Promised Land. The Lord that said you must gather as much as you need for each day but, he warned, don't leave it overnight because it will spoil if you do." So the people gathered the white stuff. The white, grainy stuff was the same size as coriander seed, or about as big a pearl, but flat, and they called it "MANNA," which means, "WHAT IS IT?" They had to gather it early in the morning before it melted in the sun and disappeared, and there was exactly the right amount for everyone. Cautiously, they tasted it and, WOW! They were pleasantly surprised because it tasted just like honey bread. 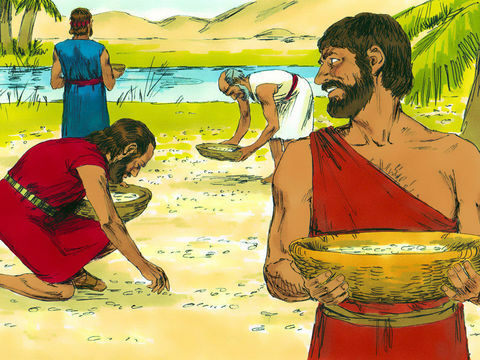 The Israelites invented a recipe, so they ground it like grain and cooked it to make pancakes. YUMMY! Some of the people were a bit lazy. They didn't want to get up early each the morning to gather manna, so they disobeyed the Lord and decided to put away some manna in a container for the following day. The next morning, they slept while the other people were gathering manna. When their hunger pangs drove them out of bed and they opened their containers to make manna pancakes for breakfast, PHEW! They were met with the most disgusting smell ever. The leftover manna was full of stinking, crawling maggots and they had to throw it away, outside the camp. So the disobedient people had to go hungry that day! On the 6th day, there was twice as much manna as usual and the people wanted to know why. 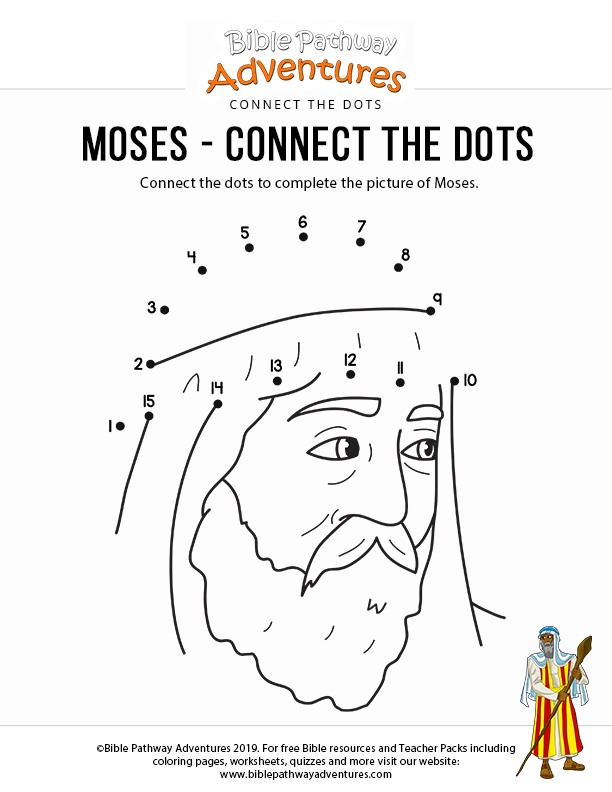 Moses, the patient teacher that he was, told the people that it was because the 7th day was the Sabbath, a day of rest, and that there would be no manna on that day. They had to stay in their tents, resting and not go out to gather manna in the morning. Those Israelites, who were obedient to the Lord, wisely gathered twice as much as usual on the 6th day so that they would have enough left over for the Sabbath. When the 7th day came and they opened their containers, the manna was still perfectly good to eat and make pancakes from, so they rested from gathering manna that morning. But some of the people were disobedient and only gathered the usual amount for one day on the 6th day, thinking there would be manna to gather on the 7th day as well. But they were wrong! 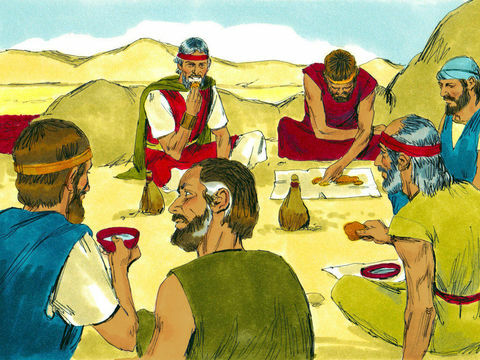 When they went out to gather manna on the Sabbath, there was no manna at all and they had to stay hungry for the whole day. By going hungry, they quickly learned that the Lord was serious about what He commanded and they learned they ought to obey if they didn't want to go hungry again. The Lord also instructed Moses to tell Aaron to take a sample of two quarts of manna and store it in a container in a sacred place, as a museum specimen for future generations. Then they would be able to see what the miracle food their forefathers ate in the wilderness looked like. 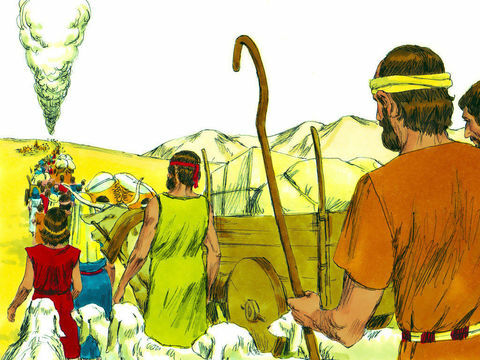 Aaron did exactly as he was told and, later, when the tabernacle of the Lord was built, they placed the manna in a special container and stored it inside the Ark of the Covenant. 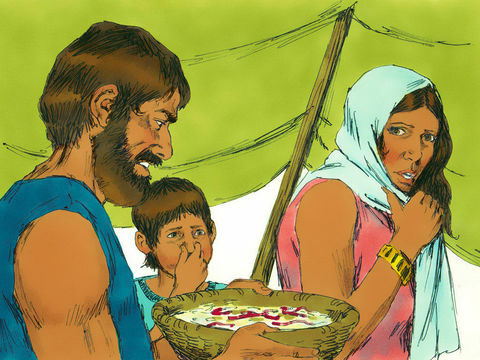 For 40 years, the Israelites wandered in the wilderness and never had to worry about going hungry again. That evening at youth group, Gus and Frank also learned that, just as the Lord proved his love by giving the Israelites bread from heaven to fill their hungry tummies, to stay alive in the wilderness, He also proved his love by sending us Jesus Christ to fill our hungry hearts and give us eternal life when we start believing and obeying Him. Just like the Israelites had to gather manna every day and eat it, we must daily spend time with Jesus by praying to Him, reading his Word and doing what it says. The best way to read your Bible is to, first of all, ask the Lord to help you understand what you're about to read and believe that He will help you, even before you begin reading. Just like food has different flavors, such as sweet, sour, salty and so on, passages in the Bible can make your heart experience different feelings, such as gladness, conviction of sin, chastisement, awareness — how to act in a situation — and many more. Also, just like some foods are easy to eat, melting in your mouth, like ice cream, some passages are easy to understand. Other passages are difficult to understand and are more like chewing on a piece of tough steak, meaning you have to take your time to think hard about it so you can digest it. We call that meditating. Sometimes you'll have to ask someone to help you understand but, just like steak is nutritious and makes you strong, if you make an effort to understand the Bible, it will build your spiritual muscles and make you strong and wise, so that the Lord can use you in his Kingdom, just like he did with Moses. God loves to know that you are serious with Him as you make an effort to get to know Him. Only Jesus can satisfy your hungry heart when you start believing in Him, take time to learn about Him and obey Him. 1. 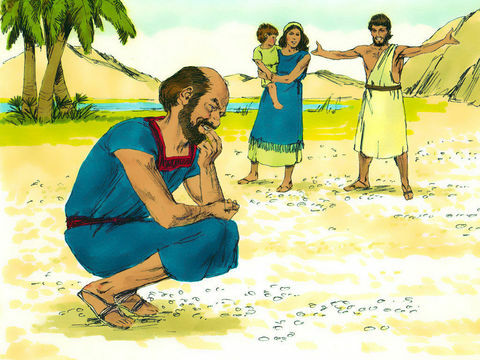 Why did the Israelites murmur in this story? 2. Did the Lord hear their complaining? 3. How did the Lord fix their problem? 4. What did the manna taste like? 5. Do you think the Lord loved them and cared about them? 6. Do you think the Lord loves you and cares about you? 7. Did everyone obey God by gathering manna only for 6 days and resting on the 7th? 8. Why must you believe in Jesus and take time to learn about Him every day? "For the bread of God is he which cometh down from heaven, and giveth life unto the world" (John 6:33). "And Jesus said unto them, I am the bread of life: he that cometh to me shall never hunger; and he that believeth on me shall never thirst" (John 6:35). real Bread from Heaven, to satisfy our hungry hearts. every day so that we can grow strong in our faith. CAN YOU FIND THIS STORY IN THE BIBLE? You will be sent a message requesting confirmation of your subscription request. IMPORTANT! YOU MUST REPLY to this confirmation request to activate your subscription to this list.